What Do Linear Quadratic Systems Look Like? ax2 + bx + c = 0 or y = ax2 + bx + c (where a, b and c are constants). (which is generally one straight line and one parabola). A simple linear system contains two linear equations (which is two straight lines). may appear on a graph, giving three possible solution situations. A solution is a location where the straight line and the parabola intersect (cross). When graphed, most linear quadratic systems will show the line and the parabola intersecting in two points, as seen at the right. If the straight line is tangent to the parabola, it will intersect (hit) the parabola in only one location, as seen at the right. It is possible that the straight line and the parabola never touch one another. They do not intersect. It is also possible when working with quadratics, that you may encounter a quadratic where both the x and y variables are squared (with the same coefficients); a circle. A solution is a location where the straight line and the circle intersect (cross). Click here for a refresher on graphing circles. 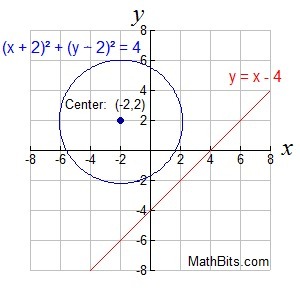 When graphed, most linear quadratic systems will show the line and the circle intersecting in two points, as seen at the right. If the straight line is tangent to the circle, it will intersect (hit) the circle in only one location, as seen at the right. It is possible that the straight line and the circle never touch one another. They do not intersect.